Sant Ekanath Maharaj is one of the greatest saints of Maharashtra. He was born in Paithan, on the banks of River Godavari around 1533.Paithan is a holy place and in those days it was a centre of Sanskrit learning as well as Brahminical orthodoxy. Ekanath was the great grandson of the well-known saint, Saint Bhanudas. His parents died when he was 3 years old and he was brought up by his grandparents. He became a disciple of Janardana Swami who lived a little distance away from his town. His Guru made him undergo spiritual disciplines and taught him Sanskrit grammar, philosophy and basic texts of the Vedanta and other holy books. It was here that Ekanath studied the holy Dnyaneshwari, which is a commentary on the Bhagvad Gita made by Shri Dnyaneshwar Maharaj. Shri Ekanath Maharaj’s glorious work was based in the time span of 150 years after Shri Dnyaneshwar Maharaj and 150 years before Chattrapati Shivaji Maharaj and Tukaram Maharaj. When Ekanath Maharaj completed his education, Guru and disciple went on a pilgrimage. At Tryambakeshwar, they heard a discourse on the 4 fundamental shlokas of the Bhagavat Mahapurana given by Pandit Chandroba in Sanskrit. Janardana Swami asked his disciple, Ekanath to translate them into Marathi and to write his own commentary, so that ordinary people could enjoy it. Ekanath Maharaj did this, and the result was the Chatushloki-Bhagavat, his first important work. Sant Ekanath was a great Guru-bhakta and he attributed not just this first book, but all his works to his Guru, invariably writing ‘Eka-Janardana’ i.e (Ekanath of Janardana) as his signature. He also displayed his gratitude towards Shri Dnyaneshwar Maharaj by using Dnyaniyacha-Eka(Dnyaneshwar’s Ekanath) as his signature for some of his works. The holy Sanskrit scriptures-The Brahmasutra, Upanishada and Shri Geeta together are known as ‘Prasthanatrayi’. These 3 important texts that lead us towards the true-self are called ‘Prasthanatrayi’. ‘Prasthan’ means to go towards one’s true-self i.e The Almighty. Similarly, The Dnyaneshwari, Tukaram Maharaj’s Gatha and Shri Ekanath Maharaj’s narration of the Bhagavat which are written in Marathi are considered as the Prasthanatrayi. His commentary on the 11th skanda(Canto) of the Bhagavat Mahapurana i.e Ekanathi Bhagavat which is a dialogue between Lord Krishna and Uddhava is one of the most important works. In this, the 9 traditional limbs of the ‘Bhakti Marga’ have been explained. Ekanath Maharaj a profilic writer, wrote the Bhavartha Ramayana and also Rukmini-Swayamwar that narrates the marriage of Lord Krishna to Rukmini Devi. Sant Ekanath also wrote many abhangas and bharuds. Bharuds are short poems with dual meaning, one which is secular and the other is spiritual. These bharuds put forward concepts of philosophy to rid the society of ignorance, discrimination and unjust customs. This was an innovative way to introduce moral values in the society and benefit people. During the intervening period of about 250 years between Dnyaneshwar and Ekanath Maharaj, various Islamic invaders ravaged Maharashtra. Defeats after defeats had completely demoralized people. There was the dominance and strong influence of rituals, blind faith and quackery. The need of the time was to restore people’s faith and to abolish blind faith and hypocracy, discard the caste system and also the distorted method of penance. It was necessary to instill moral values and ethics in society and Shri Ekanath Maharaj propogated those on the basis of great literature like Shri Ramayana, Shrimad Bhagavad, Shri Geeta and Shri Dnyaneshwari. 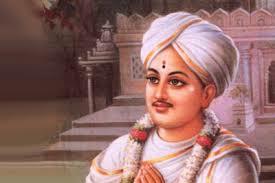 During this time the great legacy of Sant Dnyaneshwar Maharaj was nearly forgotten. Sant Ekanath devoted himself to change this situation. His first task was to locate the ‘samadhi’ of Dnyaneshwar Maharaj. He completed editing the Dnyaneshwari in 1584. In those days, there were several interpolations on the Dnyaneshwari and more than one version. The Dnyaneshwari we read today is his edition. The tradition of ‘dnyaan’ i.e knowledge and ‘bhakti’ yoga got from Maharshi Vedvyas, Jagadguru ShrimadAadyaShankarayacharya-The promoter of Advait (non-duality), Vishvaguru Shri Gorakshanath Maharaj and Santshreshtha Shri Dnyaneshwar Maharaj was made available to the common people by Eknath Maharaj. Shri Eknath Maharaj was a great preacher of the Bhagvad Sampraday. The Bhagvad Sampraday is a wonderful confluence of the concept of yoga from the Natha Sampraday and the concept of ‘Bhakti’ and ‘Dnyaan’ from the Vaishnava Sampraday. Thus he created a fusion of ‘Bhakti’ (devotion ) and Advait (non- duality). He taught the people the importance of ‘bhakti’ and also taught the devotees the essence of pure knowledge. ‘Chaturvarnya’ i.e Brahmin, Kshatriya, Vaishya and Shudra were considered as the 4 castes of the Aryan society. Sant Eknath Maharaj eliminated this misconception from minds of people and preached that Chaturvarnya were not castes that discriminated the people in society, but they were 4 classes of the Aryan society. They were also the 4 qualities in society. Shri Eknath Maharaj said that we adopt different qualities in different situations and accomplish our duties. Thus he re-established this thought from the Upanishadas. Shri Eknath Maharaj declared that every individual had the right to gain knowledge. This brought about a change in society and the socially neglected people also started believing in God i.e The Almighty and attaining knowledge. Sant Eknath Maharaj worked for the upliftment of the downtrodden, socially oppressed classes like the Garudi, Dombari, Kaikadi, Bhoote and Mahar and enabled them to enhance the quality of their thoughts and life. In this manner, Sant Eknath Maharaj preached brotherhood and unity and criticized the caste system prevalent during that time.